Discussion in 'Xbox 360 Guides' started by InsaneNutter, Nov 26, 2009. First you need to connect the Xbox 360 hard drive to your computer using something like the Microsoft Transfer Kit, the Xport Docking Station or the Datel Xsata. Download Xplorer 360 for 20 / 120gb drives or for 250gig drives. DO NOT USE THE 250GB VERSION ON A SMALLER DRIVE OR VISA VERSA, IT WILL CORRUPT ALL YOUR DATA. Now load Xplorer 360, be sure to run it with Administrative rights. Now click on Partition 3 then on the Cache folder, the contents of the folder should be displayed as in the image below. Extracting a title update from the 360 hard drive. This is the hard and annoying bit now, as you will notice the folder is full of temp files and title updates, if you are wanting to extract a title update there is no easy way to find out which update is which. My suggestion would be to dump the everything in Cache folder to your PC then delete it from your Xbox 360, go on Xbox Live, Play the game you want the title update for and let it download. You should only have the title update for that game in the Cache folder, you can then dump it to the desktop as seen in the screenshot below. After you can add the contents of your cache folder back to your hard drive if you wish. You might need to copy the COMDLG32.OCX from the 360 Tool folder to your Windows\System32 folder then right click on the .exe and run it as an administrator to get it to work correctly. 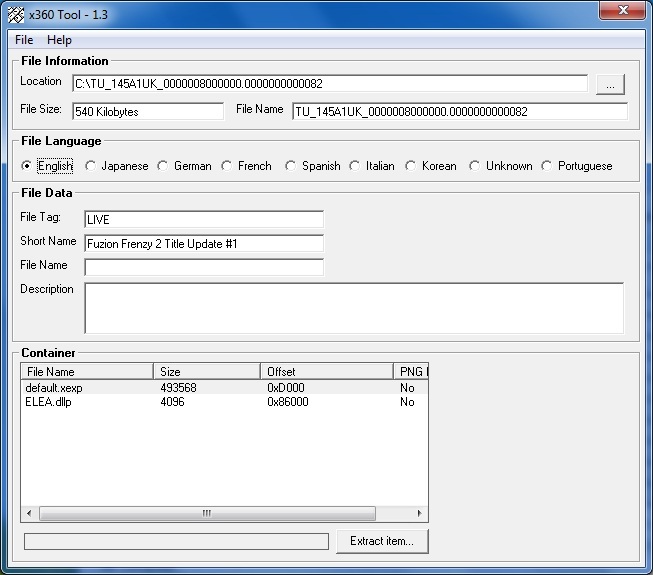 That’s the only way I could get the tool to work correctly on Windows 7 64bit. You can then see information about the title update you extracted as seen in the screenshot below. Hopefully you extracted the update you wanted, if you don’t want to use my suggestion above for easily getting the update your after just keep extracting them until you find the one you are after. Dumping a downloaded title update to the 360 hard drive. 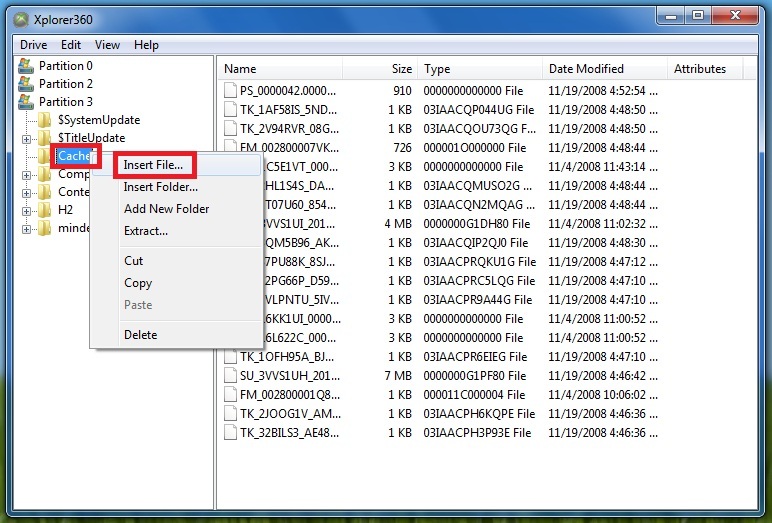 This is the simple process of opening your hard drive in Xplorer360 as demonstrated earlier in this guide then right clicking on the Cache folder and selecting insert file. 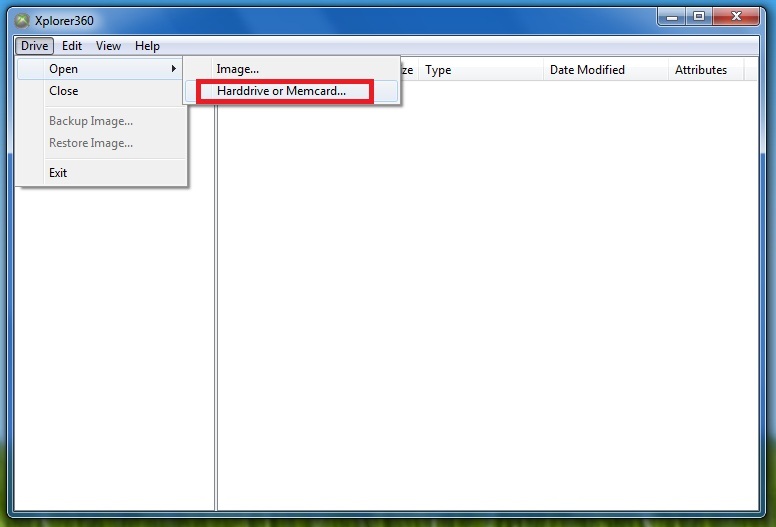 Do this and find the file you want, it will then be injected to the 360 hard drive. If you have downloaded a Title Update from Digiex or found this guide useful please consider sharing your title updates with us. Unlike Demos it is not easy for the few uploaders here at Digiex to get title updates as it requires the person to own the game… lets be honest we don’t all have 100’s of Xbox 360 games! With demos anyone can download them from the market place, which makes getting the demos people want a lot easier than title updates. JKer, Rick, Stealth Geek and 5 others like this. I tried connecting my 60Gb HDD to my PC using Xplorer360 and it would not recognize the Partition 3. I found a program called Xport (V2.12 I think) and it not only works with the 60Gb HDD, but seems to tell you what the Folders and Files are in real English, in Brackets at the end of the File/Folder name. This may help with distinguishing what update you are looking for on the HDD. I joined digiex specifically because of the title updates and am looking to contribute to the effort. I have a few questions though. 1.) In going through my cache, I found updates for arcade games I did not have; they were demos that came preinstalled. If its true we can get the arcade updates with out the game, should these be submitted? 2.) In going through the cache, I could not find the updates for a few games I know I have (Halo 3, Left 4 Dead). If the cache does not store the updates permanently, is there much point copying them into the cache like this? Or did I miss something? 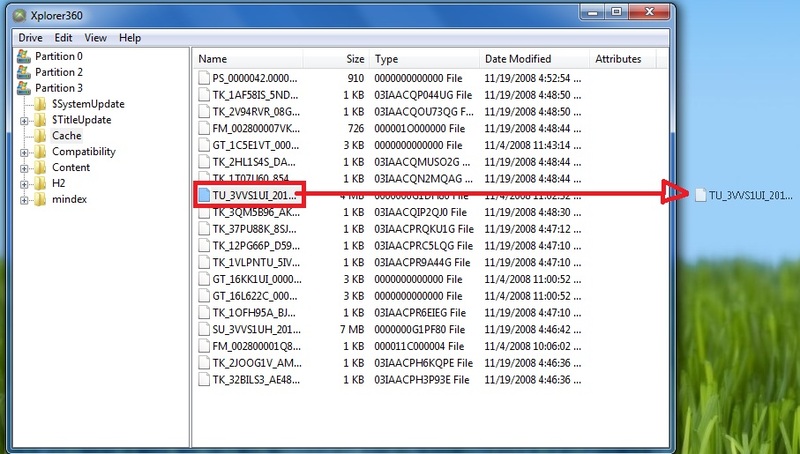 I only looked at files beginning with "TU". Thank you in advance. I look forward to being part of this community. You can get arcade game updates from just playing the trials, so feel free to upload them im sure people will appreciate it. As for some updates not been there, items in the Cache folder are like temp files on your computer they could be deleted at any time. I think there is even an option on the 360 dashboard to clear the cache so thats probably whats happened there. The main reason people want title update is you often need the same title update as your friends have to play system link games. The update could fix an annoying bug in the game too or enable downloadable content to be used. Its really up to you if you feel the need to use them or not. Right, but if copying an update from the PC to the HDD doesn't permanently install the update on the XBox, is there much point in this? The only game I have seen that makes it clear what version it is is Halo 3. Do I constantly have to be using the XPort/Xplorer360 to look at the cache to see what updates I have? If you have a problem with a game that an update fix's (Worms 2 for example) or want to play system link with an updated game (Halo 3 / Halo Wars) then yes, if not then no you dont really have use for the update. The majority of updates should just stay on your console so i wouldn't worry too much about checking. OK. I guess this is kind of a new subject. One problem with these updates is that it's being harder than it should be to figure out what they do. I'll keep looking for the changelogs and post them in the title updates section if/when I find them. I'll keep playing around with it and post updates and I hope others will do the same. Indeed a lot of them are just pushed out on Xbox Live with no announcements made about them. Some just fix exploits that allow people to cheat on live, some enable new DLC, and others just patch bugs. Question, if there are multiple title updates for a game, do I need to have all of them, or only the latest? Only the latest I believe. Ok, I've learned a little more that about title updates that I want to share with everyone. 1. You do not need the full version of an arcade game to get the updates for it. However, simply downloading the trial is not enough to get the update. You must start the game while signed in to XBox Live. If there is an update, you will be prompted to download it. 2. Most arcade games do not have updates. Of the arcade games I tested, between one third and one half had updates. 3. It does appear that updates installed into the cache are permanently stored. I have opened my HDD's cache a second time to install updates and found that updates I had put in had been copied to the Content folder. 4. Changelogs for updates are hard to find. However, there are a few sources you can try if you want the changelog: the discussion forum for the game, online strategy guides, and wikis (usually only for series or very popular games). 5. Digiex does not support apostrophes (') in filenames. Everything up to and including that character is dropped. Yeah, updates no matter what, that is how they stopped the bug in Shadow Complex so no one could play the full game without paying, though its obviously still possible if the update isn't downloaded or deleted. I'm having trouble getting the title updates to load on a previously banned console. In my Cache folder I have some crazy garbled characters. I have tried dumping the Title updates into the Cache folder and firing up games but they are still not loading the proper updates. Running on the 8955 system dash. Any help would be appreciated. The one I am trying to get working is Gears of War 2 - TU #5. Use Xplorer 360 Extreme Edition, I have had nothing but problems with Xport 360. Which version of Xplorer supports the 60GB hard drive? Will the game tell me in any way thats it updating/updated the game? I copied a TU for a game into the part3 cache folder. But when i start the game its not telling me it updating or anything like that. is something wrong? or do i just have to guess its updated? Well if your having any problems with the game see if there fixed, if yes then the title update is working. Some games like Halo 3 tell you the version number on the main menu, for most games you wont notice any difference unless you notice its fixed a bug for example. If you got the title update for your region or a region free update its most likely working. Should I delete the duplicate files so there's just 1 there, or am I OK leaving it as it is? Has anyone else encountered a problem using x360 tool with COMDL.OCX? I've tried multiple ways to get the dependencies correct but cant quite get it to work. I'd really like to get it to work because I would like to both add title updates and download title updates from digiex but I would be unsure of what I am uploading without a working x360 tool. Thanks in advance. 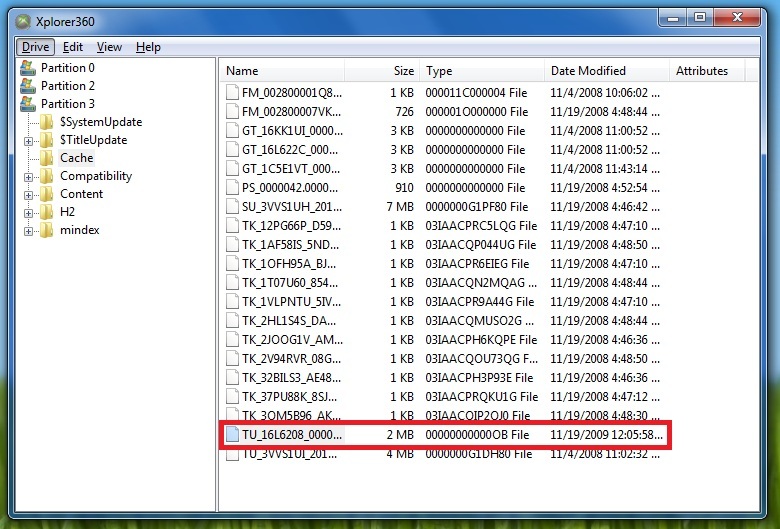 If you downloaded x360 Tool from here I included COMDLG32.OCX in the zip file, just unzip both to the same folder. After right click on x360Tool.exe and run the program with administrator rights, it should work perfectly then.